While recent advances in computing open new possibilities for visualizing patterns in cultural artifacts, we can find many important precursors created much earlier without use of computers. For example, beginning in the early 1960s, many media and later new media artists have been restructuring TV programs and films in a variety of ways (slowing down, speeding up, sampling and repeating, etc.) to reveal ideological and formal patterns in this media content. Another relevant practice is the use of diagrams by artists, choreographers, architects, composers and others to plan and analyze their own works. We can also find interesting precursors in print culture. For instance, a familiar book index can be understood as a visualization technique. Looking at the book index you can quickly see if particular concepts or names are important in this book – they will have more entries than the concepts that take up only a single line in the index. This visualization of the complete text of Anna Karenina is inspired by a common reading practice of underlining important lines and passages in a text using magic markers. 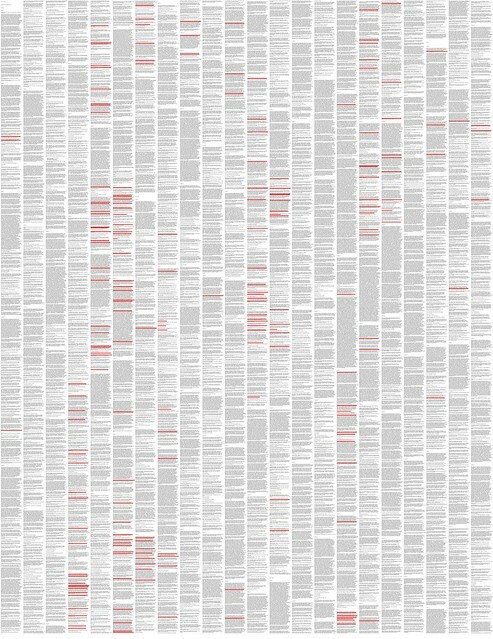 To create this visualization I wrote a program that reads the text from a file and renders it in a series of columns running from top to bottom and from left to right as a single image it also checks whether text lines contain particular words (this version checks for the word Anna) and highlights the found matches. Data: The compete text of Lev Tolstoy’s Anna Karenina (English translation: Constance Garnett). Number of words: 351,000. Number of lines: 43,200. Timescale: The novel was published in serial installments from 1873 to 1877 in the periodical The Russian Messenger. 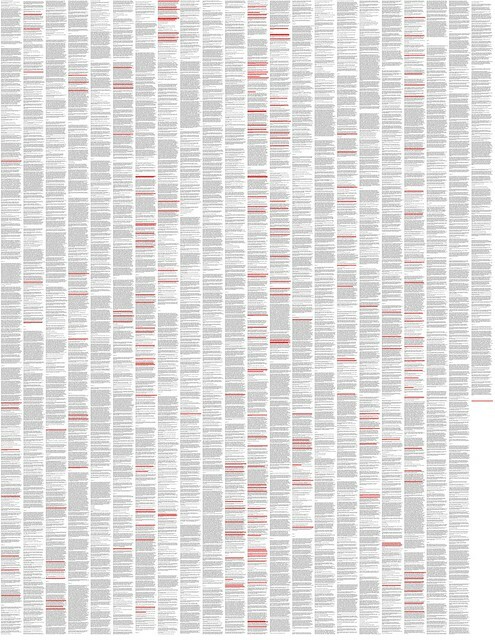 Mapping: The text of the novel is arranged on a single page. Reading order: top to bottom, left to right.